This book opens with Lillian's story. Now, she runs a busy restaurant but she still finds time to run a cooking class in the restaurant kitchen each Monday. As for all chefs, it has taken Lillian many years of dedication and hard work. When she takes time to look back, she can see just how far she has comes. Her journey has taken her from a neglected little girl who found love and affection, and more importantly, learnt to cook in the heart of someone else's family. As the first class is set to run, we meet each of the new students; a young mum who is struggling to find her identity: a young girl who is looking for her place in the world; a man who is gradually emerging from his cocoon of grief: an older couple who are happy now but who haven't always been as together as they seem, an Italian immigrant who is looking for a sense of home; a computer geek who doesn't feel as though he fits in with his family and more. Each week, the group comes together to learn new techniques but also to learn to be honest with themselves and to communicate with each other. If you are looking for an overall plot to the book, there really isn't one. Each individuals story moves forward as we learn about what bought them to the cooking class, what they are struggling with and how the food that they are cooking and eating brings them to a new understanding and in some cases new beginnings. Effectively, these are a series of vignettes of the characters that are connected to the restaurant. Sometimes though, you don't necessarily need a lot of plot. Sometimes good characterisation is enough, and I would say that it is generally the case here. Each character is given the time and space to develop right before your eyes. This is an easy read. The writing skips across the pages and before you know it you are at the end. It is a perfect Saturday afternoon book - a couple of hours easy and pleasant reading. In terms of the stories, I think that the most profound as that of Tom. He was dealing with the grief of losing an important person in his life, and the portrayal of their illness and subsequent passing as treated with compassion, dignity and respect. Whilst his is not the only story that moved me, it is the one that has stayed with me the longest. One of the best things about books like this are the food descriptions, and this book does not disappoint. There were a number of times that I was left drooling at the feast for all the senses that were described. One of my favourite chapters was where the group cooked a ... I guess the word is deconstructed... Thanksgiving dinner. Now, we don't do Thanksgiving but I have seen enough descriptions and posts about the food that is normally on the table, and so I recognised how even though the meal looked completely different, all the traditional elements were there. 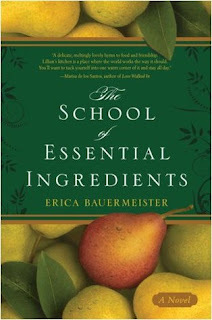 Erica Bauermeister has a number of recipes on her website and also includes some details such as where her inspiration came from. Not only did I want to eat the food that was mentioned in the book, but I also was left wishing that I could go to Lillian's cooking classes, or at the very least some cooking classes here. I suspect that the experience would be very different from that portrayed in the book but it would still be fun. Maybe one day. Once a month on Monday night, eight students gather in Lillian’s restaurant kitchen for a cooking class. Among them is Claire, a young woman coming to terms with her new identity as a mother; Tom, a lawyer whose life has been overturned by loss; Antonia, an Italian kitchen designer adapting to life in America; and Carl and Helen, a long-married couple whose union contains surprises the rest of the class would never suspect. The students have come to learn the art behind Lillian’s soulful dishes, but it soon becomes clear that each one seeks a recipe for something beyond the kitchen. One by one, they are transformed by the aromas, flavors, and textures of what they create, including a white-on-white cake that prompts wistful reflections on the sweet fragility of love, and a garlic and red sauce that seems to spark one romance but end another. Over time, the paths of the students mingle and intertwine, and the essence of Lillian’s cooking expands beyond the restaurant and into the secret corners of their lives, with results that are often unexpected and always delicious. I remember I wanted to take cooking lessons after reading this book too. Such a great book and you're right; the food descriptions do not disappoint! The audiobook is fantastic as well, it has a great reader! I would probably be disappointed if my cooking lessons didn't feel as good as reading about these ones did Heather! oh, I loved this book. Her next, not as much. Caite, my library doesn't have her next book so I will have to wait a while to read it I guess. Disappointing that you didn't enjoy it as much as you did this one! This does sound like a great Saturday afternoon book. Have a great weekend! Lisa, it is perfect for a relaxing read any time really! I enjoyed this book too. I know that after I read it I was enjoying cooking a lot more and I tried making new things that were out of my comfort Zone. Something that makes you step out of your comfort zone is a good thing really Anne! I can't for the life of me figure out why I haven't read this yet! I think I'll wait for the first warm & lazy Saturday and sit out on the deck and read it cover to cover. I love the idea of short characterizations. Me either Beth! Other than the so many books so little time cliche of course! The first thing that came to mind when I read your post was that this sounds like a true-life version of Maeve Binchy's Evening Class. It was about a group of people who came together to learn Italian, and I enjoyed that book. I think I'd like this one too. Diane, I haven't read a Maeve Binchy book for years and years. I used to like them a lot! Pam, I really love books about food and people too! This sounds good, one I'm sure I'll enjoy! I'm adding it to list, thanks! Carol, I hope you do enjoy it if you get to read it! Sounds really good will see if the library has it. Thanks for the link to a few recipes too! You are welcome Peggy. Thanks for stopping by. I liked the sound of this. Thanks for sharing it. It was my pleasure Carole! I love foodish books... I want to try this one. Sheila, I hope you get to try it. I think you would enjoy it. I think this likes sounds like a perfect summer read. I'm going to check to see if my library has it so I will be ready. I would love to take a cooking class that was relaxed , filled with interesting characters. It sounds like some kind of nirvana really doesn't it, Peaceful Reader? I absolutely loved this book. Bauermeister's writing is lovely; I could almost taste and smell the food while reading. Tom's story was very sad. Yes, the writing was very good at engaging the senses! Have you read her next book Anna?